The MFT design team is back to share a few more cards created with products from the latest MFT release. If you haven't had a chance to check out the last release yet, you can find all the new products HERE. 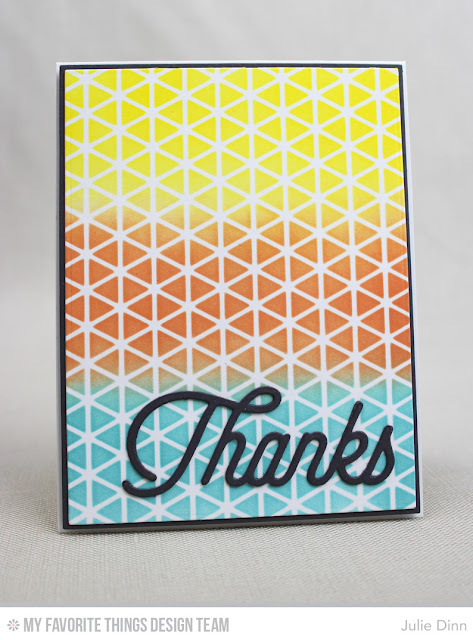 I have a colourful card to share with you today featuring the new Geometric Grid Stencil and the Twice the Thanks Die-namics. I love using stencils to create a fun and colourful backgrounds. For this card, I used Daffodil, Orange Zest, and Blu Raspberry Hybrid Ink. The thanks was die-cut with the the Twice the Thanks Die-namics in Steel Grey card stock.